Nelspruit - Bongani Zungu snatched a dramatic equaliser in the final minute of stoppage-time as South Africa held Nigeria to a 1-1 draw in a friendly at the Mbombela Stadium on Sunday. The visitors, on the back foot for much of the match, looked set for the win when Ahmed Musa scored a stunning goal five minutes from time. But as the home team poured forward in search of an equaliser, Nigeria goalkeeper Daniel Akpeyi could only parry Thuso Phala's flick towards goal and Zungu crashed home the rebound. Nigeria captain Musa had been quiet until he picked up the ball on the left-hand side of the box, cut inside and unleashed a powerful shot into the top corner. 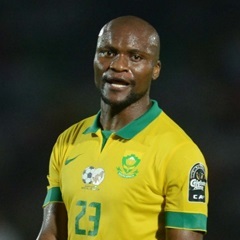 South Africa had dominated the match to that point and missed a penalty after 63 minutes when Andile Jali's tame effort was saved by Akpeyi after Thulani Serero had been felled by Godfrey Oboabona. The home side had a number of other opportunities for what would have been only their second victory over Nigeria in 23 years, but a mixture of poor finishing and fine stops from Akpeyi denied them a morale-boosting win.